Our top picks for cast iron gloves. A detailed comparison table with materials and temperature thresholds. What you should look for in a top quality oven mitt. A detailed analysis of all our picks. What Does the High-End Oven Mitt Market Look Like? Whether you're cooking in a c﻿ast iron skillet, enameled cast iron cookware, or brewing tea in a cast iron teapot, or even grilling up some veggies, having strong and heat resistant gloves is important. It should be built to last a long time, this isn't going to be your cheap oven mitt that you pick up at the local dollar store. It should be large enough to cover more than just your hand. If you're going to make the investment - why not get something that's appropriate for other high temperature activities such as reaching into hot water. Unfortunately, this attribute may be a trade off as some of the super high temperature gloves aren't designed to work with moisture. It should make gripping easier as you don't want to drop any hot cast iron cookware as doing so can ruin your floors, or even worse, cause injury. 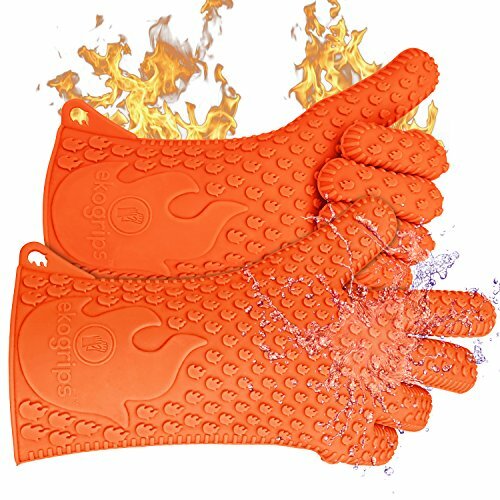 Super heat resistant gloves should be EN407 certified. Being that a lot of these are grill gloves – they will be useful beyond just handling cast iron. Being that most of us could use some more vegetables in our life, we wanted to recommend this Grilling Vegan Cookbook for use with your new gloves! The most elite brands in the oven mitt market can be divided up by two materials: Silicone and a Kevlar/Nomex/Aramid Blend. Each of these choices comes with its own advantages and disadvantages. The silicone oven mitts simply aren't going to be as heat resistant as the ones made from Kevlar/Nomex materials. However, they come with the advantage of being super "grippy" as well as waterproof. Many brands even advertise sticking the gloves right into a pot of boiling water. This means if you want to check your pasta or pull out a potato you can do it quickly and easily without clumsy utensils. The oven mitts made from Kevlar/Nomex are going to be far more heat resistant. So much so that they are advertised to be resistant temperatures up to 932F! The problem is that they typically aren't waterproof, so dipping your hand into a pot (like you can do with the silicone style gloves) is going to be out of the question. Let's get into a little more detail about the pros and cons of each product to help you make the best choice. The Ekogrips gloves are one of the most popular heat resistant silicone gloves on the market. The main reason why we decided to feature this glove is for the waterproof properties that it has. Being that we love cooking with vegetables, we're always steaming and boiling. Having the ability to put on a glove to take out a piece of pasta or a potato is quite convenient because the rolling water can sometimes move things around rapidly. The heat resistant threshold was low compared to the others, but for regular kitchen tasks, it should be all that you need unless you're placing things under an extremely hot oven broiler. Resistant to catching fire - even when exposed to an open flame. Has 5 fingers for improved dexterity - makes it easy to grab different shaped pots and pans that a mitten may make difficult. Silicone lining for extra grips. Can't handle excess water exposure like the silicone gloves. 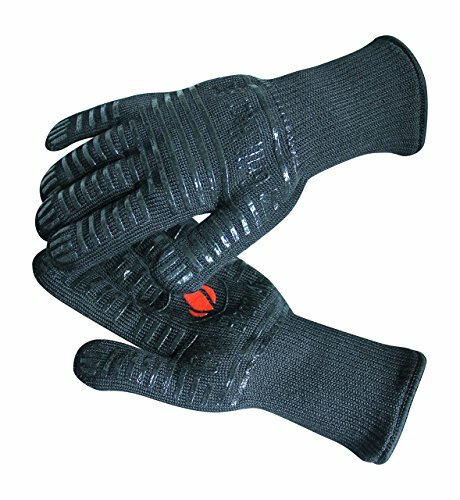 When it comes to heat resistance, these gloves are going to be near the top being able to withstand heat up to 932F. However, this might be excessive for the regular home cook since its rare that you'd turn your oven over 450F, but it could be good for peace of mind. That being said, if you like to light bonfires or have a fireplace, these could come in great handy as you'll have a full human hand to move the logs around. It's also great for handling vegetable grill baskets. Has an inside cotton lining for extra comfort - easy to slip on and slip out. Probably only half-way good in hot water due to the cotton lining - don't want to get it wet. 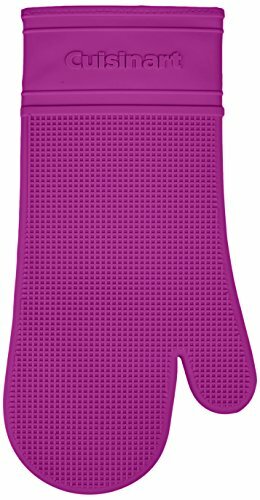 The major difference between the Cuisinarts and other Silicone gloves is the cotton lining. If you've ever handled silicone, you know that it grips onto everything (including skin) and thus can be slightly uncomfortable or hard take on and off. With the cotton lining, you get extra comfort, but lose some of the waterproof ability. 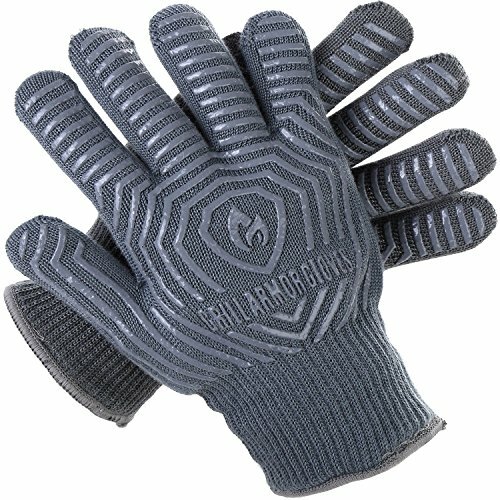 As far as we could tell, these were just another style of the Grill Armor Gloves. Not that there's anything wrong with that, we just wanted to give you some more variety in terms of style and color! They have similar levels of heat resistance and are going to present the same cons in terms of ability to handle water. For the pros and the cons, simply refer to the Grill Armor Gloves above. Easy to get on and off because of the lining. Heat resistant up to 450F. Manufactured in a wide range of colors. Not going to be ideal for water immersion compared to an all silicon glove. 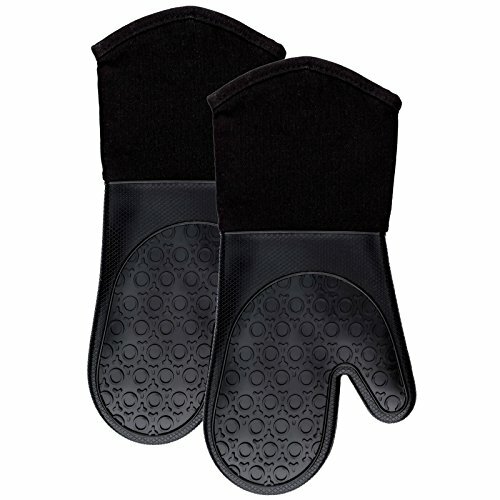 The HOMWE qulited oven mitts are similar to the Cuisinart ones, but with a little extra lining. Because the inside is lined with cotton, they are easy to get on and get off. We also thought the design was pretty neat and unique. Finally, they are easy to clean by throwing them into the washer machine, but all of these gloves are pretty easy to clean so that doesn't give it much of an advantage. At the end of the day, all of these gloves are great picks for handling any sort of cast iron cookware. If you deal with temperatures above 450 you'll probably want to go with one of the super heat resistant ones, but if you don't then we'd suggest the silicone.